I had meant to see this movie in a theater, where it must look even more stunning on a big screen, but I’m happy I did see it at home. It’s the type of movie I watch once and then watch again immediately, without the sound. It’s a feast for all of your senses, but there’s exquisite visual storytelling that takes place, the nuances of each character, the locations, sets (unless this was all location work, which it looked to be) costumes, and gorgeous second unit shots, that you miss on first viewing. One of my favorite Tumblr blogs (or is it just Tumblrs?) is Capucha which follows the life of a little French girl named Capucine and her family, animals, etc. It’s like stepping into a French fairytale or an Anthropologie store come to life. It’s full of whimsy and heart. Capucine’s mom, Anne, is also a talented photographer and has excellent taste in music. Thus, I’m swiping this week’s Listen pick from a recent post where she reblogged a list of music/music videos about photography. This video was completely new to me, so I wanted to pass along the discovery. Check out the rest of the list here. They’re all wonderful. 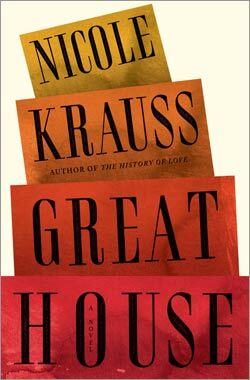 Nicole Krauss is one of my favorite living authors. Her new novel, Great House, offers more of the exquisite prose and beautiful storytelling she first gave the world in Man Walks Into a Room and The History of Love. I’ve just started Great House and I have already fallen under its spell. Reading Krauss’ writing feels like being under water. Time stops. Everything is quiet and there are no distractions. You are so drawn into the story, you forget to breathe. Inhale deeply and pick up Great House.